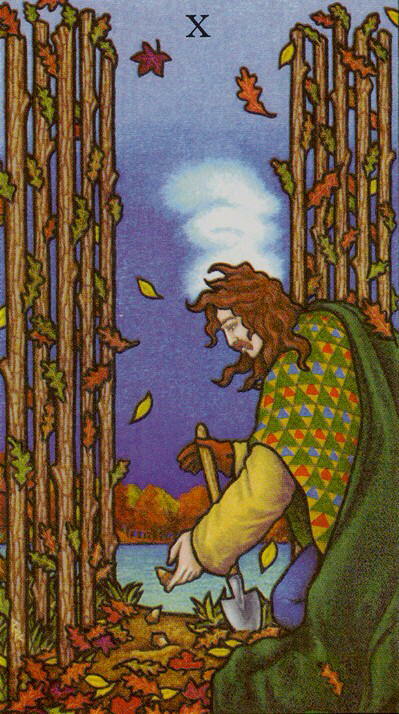 The 10 of Wands typically shows a person carrying a heavy bundle of sticks (wands, rods, etc.) with much strain and effort. As such it is usually interpreted as back-breaking work, heavy workload, or heroic effort. Below you can view the various artistic interpretations of the Ten of Wands card. No concept that work is a means to support your life. Overdetermination to conquer the world and be successful. Do you work because you are forced, or for the material gains?